Many folk and traditional musicians booked for evening concerts in venues will be very willing to consider additional performances or workshop-type activity in or for schools or in other community outreach centres in the vicinity. This can help venues fulfill their outreach aims, strengthen their place within their communities and build new audiences. Combining an element of the outreach budget with the performance fee can make this a cost effective solution for the venue and helps build the overall artist fee. Folk musicians are particularly equipped to perform in informal settings as they have (mostly) portable acoustic instruments that don’t need amplification and most are very used to talking to and really engaging with their audiences. They often naturally chat about the origins of their music: how they learned it; what inspired them to write it; who passed that tune to them and something of that person’s life, and there are many songs about historical events or are social and political commentary – any of which could become catalysts for classroom discussion or stir memories in older people. Many folk musicians enjoy exploring regional digitised archives and may find a local song or tune or can play widely recognised tunes alongside the range material they will have in their concert set. For many, handing on the tradition to younger generations is something they are passionate about. 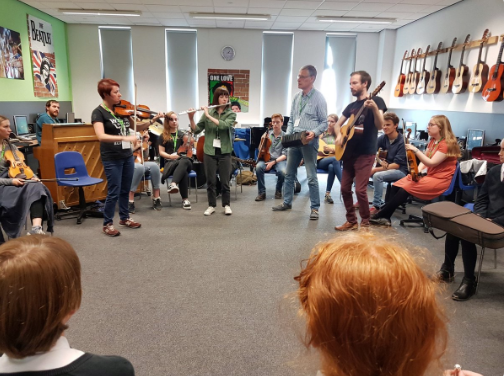 In a culture where not all children are given the opportunity to experience live music, a professional folk band playing in the school hall can spark a lifetime love of a music they might not otherwise discover. Children don’t have the preconceptions about this music belonging to a stereotypical audience, they will judge the music on how it makes them feel. And where most concert halls and arts venues are seeking younger audiences, sowing this seed early is an investment for the future. Even better is the opportunity to bring schools groups to their own concert in the venue. While the cost of buses or freeing secondary age children from their timetables are real barriers, the advantage of bringing young people to the arts venue gets them through the doors and gives them ownership – to the point they may bring their parents over the threshold in the future (particularly if every child goes home with a brochure and maybe a voucher towards a ticket purchase that might entice an entire family in!). Lots of musicians are highly skilled in delivering such workshops or community based-concerts – so next time you are making a booking, it would be great to explore this option!